Some of you may not realize that Argentina, a country rich in natural resources with a generally well-educated population, has undergone an economic collapse since 2001. The primary reasons for this collapse are corrupt politicians, and fraudulent banking institutions that colluded to put the country into massive DEBT! It is true that Argentina is much smaller than the United States, so I am not trying to say this is a perfect parallel to our current situation. What I am saying is that the root cause of our troubles appear to be similar to Argentina’s. I am presenting for you three short clips from a documentary (there are 12 in total, but you need only watch the first three to get the idea) that graphically details what an economic and banking collapse looks like. These clips were originally posted on a blog by a fellow who details the daily struggle of life in present day Argentina. As you can imagine, crime is rampant, and self-reliance is key to survival. 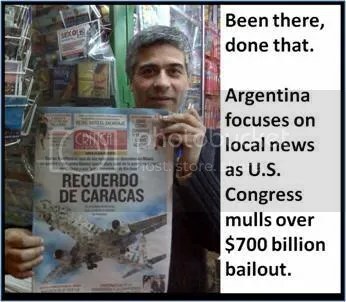 Lying politicians, massive debt, corrupt banks…..I don’t want to be alarmist but the governmental corruption that set Argentina’s collapse in motion appears shockingly similar to what is going on here in the USA. I sure hope we are not going down that path, but Americans like to do everything bigger and more extravagant than anyone else. Why should an economic collapse be any different? During times like these, it is important to be positive, and take time to enjoy life and our loved ones. I believe it is also prudent to make plans for possible problems.